I am a little worried that if we do potty train her soon, we won't be able to find underwear that will fit her... She can still wear size 12m clothes and she is almost 2! JocelynJane wrote: Source of the post She can still wear size 12m clothes and she is almost 2! What do you feed that kid? Nothing? Pftt...she can only fit into a few 12m clothes, it's not like it all fits her! She is a picky eater, but loves low calorie fruit. Highest calorie meal she does is queso easy mac or beef-aroni. She is a pretty good eater, she just really prefers healthy foods! You could get her to eat a pound of fruit before she would eat a bite of bread. She is also just built super tiny. She looks totally proportional, she just is petite. Like her daddy. Would you have ever thought in Cub scouts 17 years ago that our kids would be sharing clothes now? Evie's talking has gone way up this summer. She was talking in sentences a few months ago, but now she is telling stories. "Where's raco (Roscoe)? He went bye bye. He'll be back. He's in the bafroom. He's pooping"
How is Marshall turning one this week?! Seems like he should be at most 6 months old. How is he walking? What does he want for his birthday? I need to know now to get it to him on time! Tyler wrote: How is Marshall turning one this week?! Seems like he should be at most 6 months old. How is he walking? What does he want for his birthday? I need to know now to get it to him on time! He is walking more confidently every day but he mostly gives up after a few steps. He will walk around the house with me holding his hand. We got him a slide for his birthday along with a lot more books. 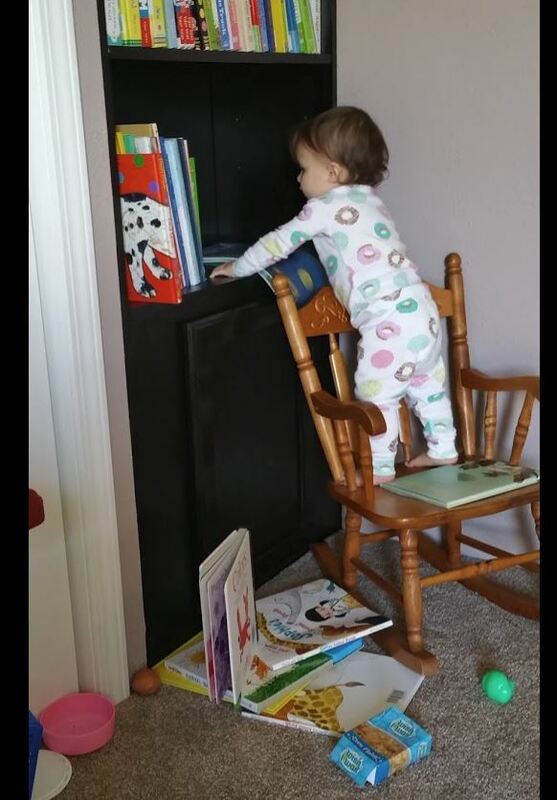 He loves taking every book off the shelf. bmyoungs wrote: Source of the post He is walking more confidently every day but he mostly gives up after a few steps. He will walk around the house with me holding his hand. Cherish that while you can! He will be running all over you soon. bmyoungs wrote: Source of the post He loves taking every book off the shelf. Duh, that's what books are for. When is his first haircut going to be? Getting long in the front. Tyler wrote: Sharing is caring. Not sure on haircut. Might wait another few months and see what happens.